When you article at Low Murchison Radnoff LLP (LMR), you will gain hands-on experience with your own caseload. You will work alongside our lawyers and participate in a meaningful way in all aspects of their practices. You will attend and conduct meetings with clients, attend Court and Tribunal hearings, argue motions, review leases, draft wills and conduct Small Claims Court trials. You will assist with the purchase and sale of a business, close a real estate transaction and draft a will and power of attorney. You will also learn how to manage and docket your time and how to render statements of account (and get them paid!). You will be given the opportunity to participate on the firm’s Committees and be welcomed at the Practice Group meetings. When the Lawyers’ Meetings are called every other month, you’ll be there at the table learning about the firm’s day-to-day operations and longer term plans. In short, you become part of our team, learning not only about the practice of law but also the business of law. At LMR we have chosen to offer our students a flexible approach to the articling experience. LMR does not have a formal rotation system. 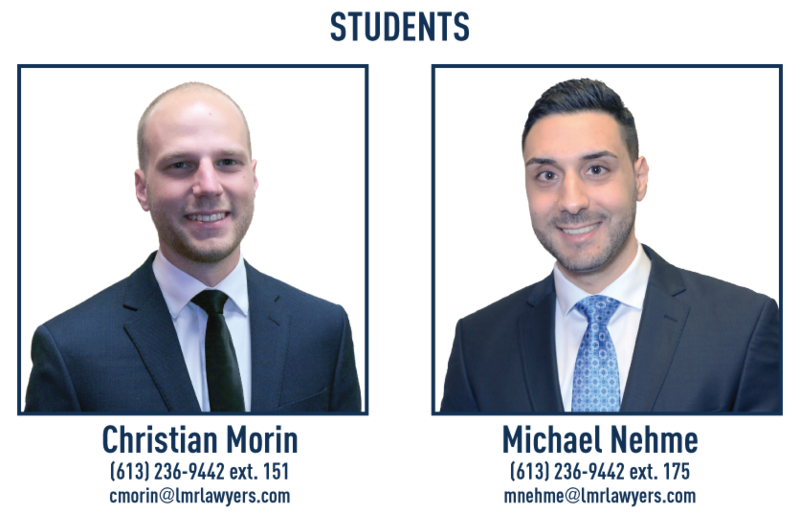 Students are given the opportunity to work in all areas of practice at the firm. 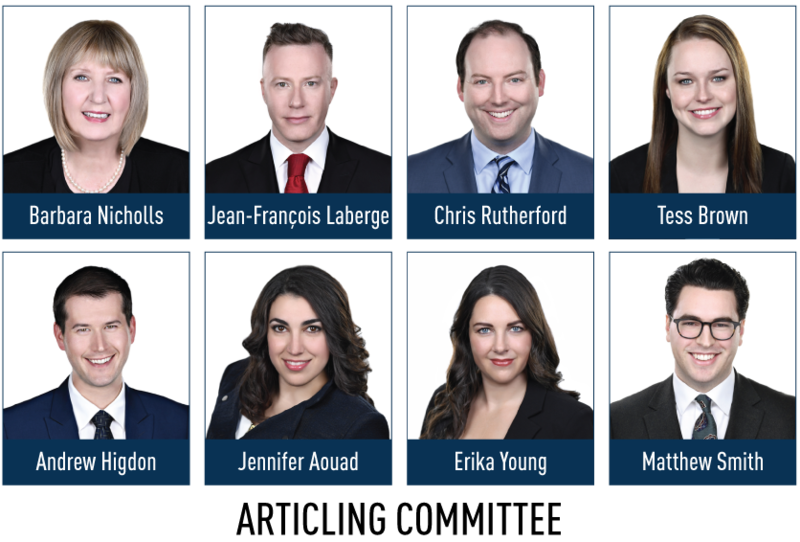 They are also given the opportunity to elect to spend a greater portion of the articling experience in a practice area of their choosing. This way you are constantly engaged in all practice areas we have at the firm. We are a full-service firm with highly respected lawyers practicing in a number of distinctive practice areas. We have a dedicated and knowledgeable support staff who are committed to our objective of providing to our clients the best of service. We believe working on a broad range of matters will give you a unique experience during your articles of clerkship. You will have the opportunity to discover what you particularly want to focus on, without feeling “pigeon-holed”. At LMR, we believe that offering to you hands-on responsibilities will give you the best opportunity to learn and grow through doing. We believe that this will provide you with a challenging and rewarding articling experience which in turn will offer to you a solid foundation for your legal career. We are sure you will also enjoy our firm’s collegial environment as you participate in the firm’s numerous social events and activities. We are looking for two well-rounded, remarkable candidates. We want our Students-at-Law to be energetic, motivated, and flexible. We’re looking for people who seek out excellence in all aspects of their lives and who can maintain a sense of humour when the going gets tough. At LMR, we embrace and value diversity. We are dedicated to ensuring that the members of our firm are as diverse as the clients we serve. If this resonates with you, then LMR wants you to find your professional home with us. Students interested in applying for our 2020-2021 articling program should submit a cover letter, curriculum vitae, university transcripts and two letters of reference to Barbara Nicholls, the Co-Chair of our Articling Committee, at bnicholls@lmrlawyers.com. Applications need to be submitted electronically no later than Tuesday, May 21, 2019 at 5:00pm (EST). Invitations for interviews will be sent out shortly thereafter, with interviews to be conducted from June 3, 2018 to June 13, 2018. One of LMR’s core values is to maintain the highest level of service for our clients. In order to achieve this, we invest heavily in the development of our Students-at-Law. You will be encouraged to attend and participate in a meaningful way in the Continuing Legal Education programs and conferences of the County of Carleton Law Association, the Advocates Society and the Ontario and Canadian Bar Associations. You will be introduced to many not-for-profit organizations and be invited to help LMR as we give back to our clients and our community. At LMR, we place a strong emphasis on training our Students-at-Law to develop the knowledge and experience that is required to become a competent and successful lawyer. Our training and in-house educational programs are designed to achieve this goal. In addition, our Students-at-Law benefit from a true open door policy and are encouraged to seek mentoring from all of our lawyers. You are encouraged to draw upon and benefit from LMR’s wealth of legal and practical information and experience.